The metrics calculations are based on nearly 1.5 billion views. The stats are collected from 1900+ media servers (including our Nimble Streamer, Wowza and Flussonic). The most interesting fact of this month is that MPEG-DASH has bigger views count than SmoothStreaming. This is a result of continuous work of DASH community for improving tools and solutions. Being a member of DASH-IF, our team keeps on improving our MPEG-DASH feature set as well. Other protocols share is pretty much the same with HLS being a leader with 69%. Check the chart below for more. 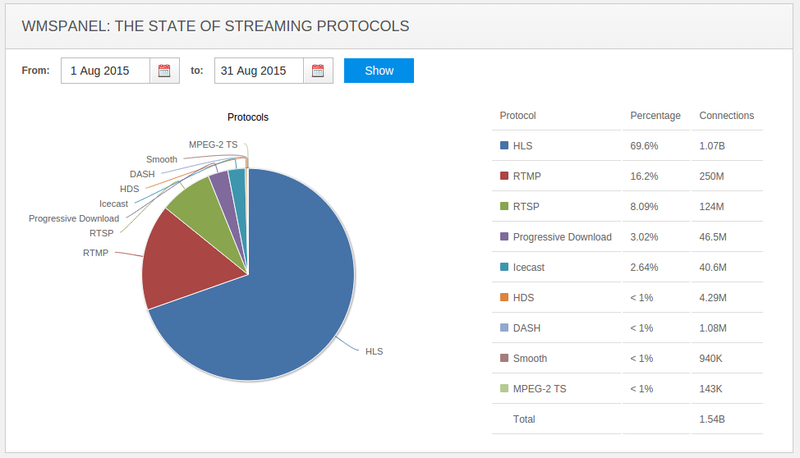 The State of Streaming Protocols - August 2015. The State of Streaming Protocols - July 2015.